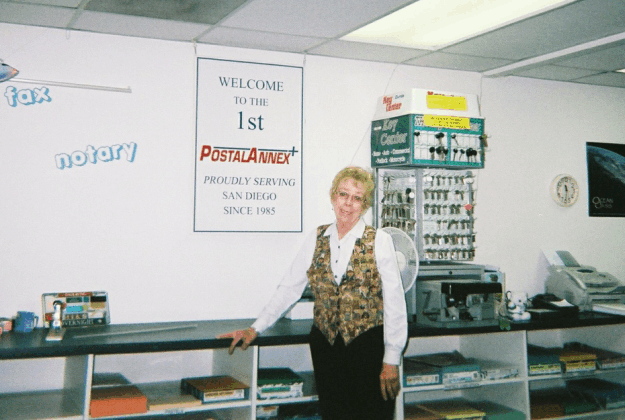 It’s been over 24 years since Jack Lentz opened the doors of the first-ever PostalAnnex+ shipping franchise in San Diego, CA, but there are some things that never change. PostalAnnex+ #1 still shares a common wall with the United States Post Office branch in the University City neighborhood. Jane Reilly, a fixture in the store for 20 years, bought the store from Lentz in 1988, and last year sold the business to another fellow PostalAnnex+ shipping franchise owner in order to downsize her responsibilities. However, Jane loves the customers and the area so much that she still works in the store, now as an employee instead of owner. Apparently, having the Post Office on the other side of the wall hasn’t interfered with her business the past 20 years. Reilly has long made a point of creating a friendly relationship with the postal staff, including one she’s known for all twenty years. It’s not unusual, then, that the Post Office frequently will refer one of its customers to her. If the cutoff time for an overnight package has passed at the USPS counter, they’ll send customers over to PostalAnnex+ where both FedEx and UPS have later pickup times the same day. Or, a P.O. clerk will send a customer to Reilly for packaging service that the USPS doesn’t provide at the counter. With so many years as a PostalAnnex+ shipping franchise owner, Jane has helped hundreds of thousands of customers looking for solutions to their small business and shipping needs. Working hard and having a good support system certainly help, she says, but it takes more than that to be profitable. Over the years, she has come to believe that relationships are at the heart of what she does. Jane is a cornerstone of the PostalAnnex+ franchise system, showing for 20 years that smart thinking, hard work, and a strong support system from the franchisor helped her turn her dreams of small business ownership into a long, satisfying part of her life.